This Instant Pot fried rice is quick and easy pressure cooker recipe. Simple ingredients, easy preparation and great flavors! 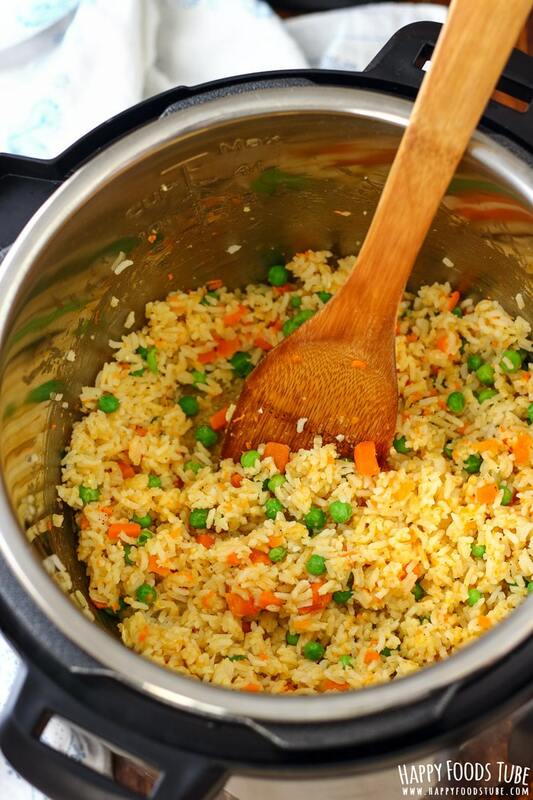 Have you ever made pressure cooker fried rice? If not, here is your chance! Cooking rice in Instant Pot is easy and hassle-free which is exactly what I am after. What about you guys? Do you have a pressure cooker? If you do, do you use it often? When I made Instant Pot Chicken Curry for the first time I was over the moon with the results. This Instant Pot fried rice dinner was no different. Full of flavors and hassle-free. Yay! If you don’t have a pressure cooker but like meals with rice, check out these easy rice dinners instead: Chicken Broccoli Fried Rice, Tomato Shrimp and Rice or Sweet and Sour Chicken. Rinse the rice and add it to the inner pot of your pressure cooker. Pour in vegetable stock and stir it around. Just make sure the rice is evenly distributed. Now add diced carrots and close the lid. Turn the vent to “SEALING” position and turn it on. Press “manual” and adjust the timer to 3 minutes. When the pot finishes cooking, I wait 10 minutes and only then I turn the vent to “VENTING” position. There is a lot of steam coming out when you do the quick release and I personally don’t like it. Safety first! So use the 10-minute natural pressure release. Now press the “SAUTE” function and stir the rice around. At this stage it will be sticky but this should change after adding the rest of the ingredients. So I move the rice to one side and add oil and peas to the empty space. Saute this for a minute before mixing everything together. Now make a space in the middle and add beaten eggs. Stir them into the rice and fry for 2-3 minutes. Turn off the pot, season and serve. The rice will be sticky at first but after sautéing it and adding peas and egg it will change its texture. If you prefer some crunch to your carrots, don’t cook them with rice but add them before you add peas. However, bear in mind that you will need longer time to cook them. Frozen peas needs only about 2 minutes in the pot before you add the egg. Eggs tend to stick to the bottom of the pan so keep stirring so you won’t end up with all of it stuck to your pot. I made this using rice program as well. I did not see any difference in the quality of the rice. That is why I prefer the quicker option. Rice program will set your Instant Pot to 12 minutes which I find way too long. For this recipe I used long grain rice. Bear in mind that there are different rice varieties and each of them might need a different cooking time. If you need a help with this, check this how to cook rice in Instant Pot post for more information. So guys, if you are looking for Easy Instant Pot Recipes, this is definitely one of them! And it tastes so amazing! Want to see how to make Instant Pot Fried Rice? Watch the video! Add rice and vegetable stock in your instant pot. Mix so the rice is spread around evenly. Throw in diced carrots and close the lid. Instant Pot Settings: turn the vent to “SEALING” position, press “MANUAL” and adjust the time to 3 minutes. When the instant pot finished cooking, press “CANCEL” button. After 10 minutes, release the pressure manually. Now mix the rice, it will be quite sticky but it should change its texture and lose quite a lot of its stickiness. Move the rice to a side and press the “SAUTE” function. Add oil and frozen peas and saute for about a minute before mixing everything together. Make a well in the middle of the rice and add beaten eggs. Stir the egg into rice and fry everything together for a further 1-2 minutes before turning off Instant Pot completely. Taste it and if needed, season with salt and pepper. This recipe was made in a 6qt/6l Instant Pot. Remove the inner pot from the instant pot body in order to stop cooking/burning the rice after you are finished. If you would like to use a different type of rice, bear in mind that it might need different cooking time. The cooking time stated in this recipe is ACTIVE COOKING TIME. This time does not include the time that is needed to bring the pot to pressure nor the time the pot needs to drop the pressure naturally (add extra 20 minutes to the overall time). What a great way to make fried rice! My family would love this! I made this tonight and it was heaven. I added a few extra seasonings (ginger, soy sauce, red pepper flakes) to help the flavor even more and dang, it was great my husband who is a fried rice freak, at 2 bowls, and my toddler devoured it. For some reason though, my rice still stayed pretty mushy though. I am still new to the IP so it could be user error. Any advice to get away from the mushiness? Rachel, I have no idea why some of the readers end up with mushy rice while others don’t. I would suggest adding slightly less liquid. Also make sure to use long grain rice as other types react differently. Hope this helps a bit. Please let me know if you have any more questions. And thanks so much for the feedback and rating! As a newbie to using the Instant Pot, I’ve been looking for new recipes to try! I need to add this one to the list since I love fried rice. I have been hearing so much about instant pots recently, I really need to try them. I need to be able to make rice perfectly. Yum! Such a delicious meal in the instant pot! So perfect for a weeknight meal. Yummy! I have GOT to get an instant pot. There are so many great recipes out there that use the instant pot and I feel like I’m missing out! When I do buy one, your recipe is going to be my first recipe as my family loves fried rice and this looks so delicious! What would the cooking time be if I doubled the recipe? Hey Tina, I believe it should be the same. :) However, you can add one extra minute to the cooking time, if in doubt. Just bear in mind that this recipe is made with long grain rice. If you used a different type, the times might vary. Has anyone used chicken broth instead of vegetable broth? I cook rice in my instant pot it takes 40 minutes? No, Rebecca. It is quite ordinary long grain rice. Definitely not instant rice. Hmm, what type of rice do you use? Also how much rice do you cook? Wild rice for example takes significantly longer to cook and also if you have a lot of it (I am guessing) – this could add to your cooking time. Do u use already cooked rice or uncooked rice?? Amanda, it’s uncooked long grain rice that works great with this recipe. How would I add onion to this? I would add the onion at the beginning – saute it until translucent and then follow the recipe (add rice, stock..).Hope this helps. I made this tonight and it was so good! My daughter was asking me if I can make it again tomorrow night. I used chicken broth instead of vegetable broth because that’s what I had on hand. I also added some corn and extra peas to get in the veggies. I am so glad to hear you and your family loved this! Yes yes, chicken broth works well here too. Thanks for the comment and rating. Hi Stephanie. Sorry for the confusion! Yes, the correct amount is 2. I have already fixed the mistake in the recipe card. I just got an instant pot and have been using it practically every day! Great easy recipe! When you add the eggs, the inner pot should be already hot enough so you should be able to see right away that the eggs are cooking already. Just keep mixing the rice (the eggs will eventually coat the rice so you won’t see much of them separately). 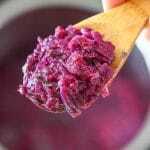 If you are not sure that they are cooked enough – then just mix until you feel confident enough to turn the pot off. As the pot is hot enough this should not take very long. When you sauté do you leave the lid off? I’m a new instant pot cooker! I would like to make this but add chicken, do you have a suggestion on how best to do that? I am new to the instant pot world. Char, I’d say the best way is to cook the chicken on stove top while you are waiting for your rice to be ready in the IP, then add it at the very end. Hope this helps. Hi, we made this tonight and though it tasted good, it turned out more like mush. We followed the directions to a T. Is it supposed to be sort of mushy? Hi Josh. It should not be mushy when long grain rice is used. Maybe try reduce the amount of liquid a bit (maybe by 1/4 of a cup or 1/8) next time you try. Hope this helps. Hey Wanda. Thanks for your feedback. I make this rice all the time and we love it. However, sometimes even different brands of the same type of rice may result in a different outcome :( . You can by no means release the pressure after 3 minutes if that works better for you. Not sure about the gummy part. I tried this recipe but when I mixed in the egg it got really mushy. What did I do wrong? Hi Jill. I suggest cooking and mixing the egg longer, until it is to your liking. The rice will be sticky but should not be mushy. Also this could happen if more eggs were added or less rice. Hope this helps. Hi Misty. Thank you for your comment. Did you use the same type of rice as stated in the recipe? If I made it into shrimp fried rice should I cook the shrimp separate? Or is there a recipe k can just add it in ? Hi Crystal. I would cook the shrimp separately as the whole cooking process in pressure cooker takes longer than the active cooking time and you might end up with overcooked shrimp. Hope this helps. Just made this for our noon meal. Turned out great. I don’t have an Instant pot but another brand so I don’t have some of the same settings so I just improvised and it was great. Thanks for a good recipe. Do you cook the rice first? In the video it looks like it is cooked before it goes in but the recipe does not say to cook it first. No, there is no need to cook the rice first. There is uncooked rice in the video as well but you are right, it looks like cooked alright. I will make changes to the recipe card so it is not confusing. Can’t wait to try this! If using a frozen carrot/pea mix, would you recommend just adding them in when the frozen peas would be added? Thanks! Hm… I am not sure. I have no experience with using frozen carrots so not sure how long they need cooking. If the cooking time of your mix is about 5 minutes, then I would give it a go. Hope this helps. Please let us know if you try. Hi Julia – I tried making this last night using jasmine rice however I encountered the burn error twice on the instant pot when making the rice. I used 2 cups of jasmine rice and 2.5 cups of vegetable broth. Any tips on how to troubleshoot this? Hm… that is weird. I would probably add more broth if it shows you the burn error. However, adding too much liquid might result in too wet a rice. Question: Have you cooked jasmine rice before in your Instant Pot? If yes, I would suggest doing it your way (+ add the carrots) and after it has been cooked, continue with my recipe. I’d say you will have to give it a go to see. Hope this helps. Waiting for this to finish cooking now! Had to use some chicken broth, as I forgot vegetable broth in my grocery order. Sesame chicken is in the crockpot to go along with it! Can’t wait to try it! Let us know how it turned out for you, Aleesha! Man – i did this and did not deviate at all from your recipe and it came out epic – thanks for the great photos, instructions and recipe! Glad to hear you loved it, Jon. Thanks for your feedback! Made this tonight with only some slight variations and it will be my go-to recipe moving forward. Thank you so much for the great work! I did use the rice setting on my device, only because I have a Express Crock and wasn’t sure how it would do on the 3 minute deal. I also found using frozen peas that already had diced carrots mixed in made for a good compromise. The other difference was a few splashes of soy sauce in the broth and after the rice was done on it’s cycle I just removed it altogether and then on the saute setting sweated some diced onion, then did the egg (my wife doesn’t like the egg coating the rice) then peas/carrots and reincorporated the rice and stirred. That worked great for me. I also made some Char Siu pork (that slightly sweet pork with the pink edges often used in pork fried rice) that I also made in my pressure cooker. The whole thing was amazing and will be a staple moving forward in our house. Thank you again, so much! Thanks so much for finding time to leave the feedback, Tony! I am sure it will help/inspire more readers to give it a go! And that Char Siu pork sounds delicious :) I have never tried it but putting it on my TO DO list for next year. Thank you for the inspiration. I took about a pound of chicken breast tenderloins, cut into bite sized pieces and sautéed with olive oil (wish I would have had sesame) in the IP until cooked through, then removed from the IP and started your recipe. My rice was super sticky, but had a good flavor. I remember an IP Mexican Rice recipe that called for sautéing the rice until golden before pressure cooking. I am going to try that next time and maybe that will help the sticky. I also removed the rice before cooking the egg, then added rice, chicken, and a few tablespoons of Soy Sauce all back together and made sure it was heated through using sauté and stirred frequently . It’s a really good recipe. We gobbled it up. Thanks!!! Thanks so much for taking time to leave the feedback and your tips, Kristi. I have never tried sauteing the rice but will give it a go next time! Mine turned out mushy. The flavor was good. I did add some cooked chicken. I’v only had my IP for a month, so I’m still learning. Let’s be honest, I never would have been brave enough to leave my rice button if not for this recipe! Even as it cooked I was nervous about the rice cooking all the way. I’m pleased to say this recipe worked really well! I did make some substitutions: 2 1/4 c. chicken broth with 1/4 c. low sodium soy sauce. I did saute some diced onion, bell pepper, celery, and garlic before adding the rice + liquids. I also threw in a little bit of left over rotisserie chicken. Yum! Even my picky preschool girls are eating this up! I noticed several people commenting about their rice being mushy. It’s the starch on the outside of the rice that often makes it sticky and mushy when cooked. To remove excess starch from the rice before cooking, rinse it thoroughly in cold water until the water runs clear. I use a fine mesh colander to do this. Hope that helps.